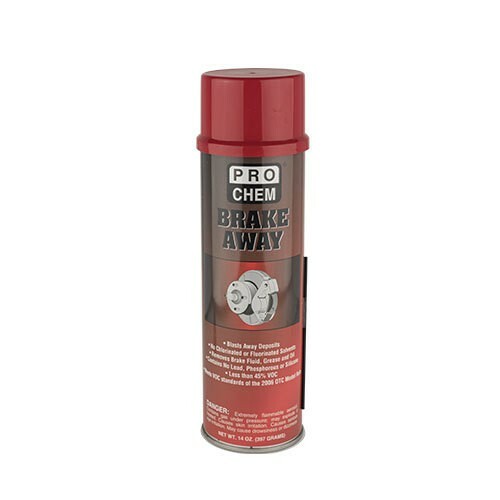 Brake Away | Pro Chem, Inc. BRAKE AWAY’s highly active solvent blend provides maximum performance in a brake parts cleaner without the use of ozone depleters or chlorinated solvents. 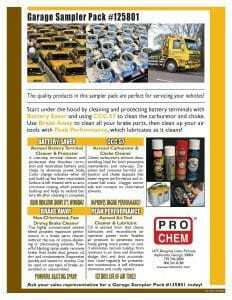 Powerful blasting spray easily removes brake fluid, grease, oil, dirt and contaminants from linings, pads and drums. BRAKE AWAY evaporates quickly and leaves no residue. Can be used on any type of brake, assembled or unassembled. Also suitable for cleaning equipment, tools and parts and meets or exceeds current OTC and LADCO VOC requirements. Remove cap and insert extension tube provided into spray tip. Hold can upright and keep tip pointed at dot on valve cup. Spray parts liberally and allow to run off. Air or towel dry with clean, soft wiper. Repeat as necessary. Protect rubber, fiberglass and plastic parts from over spray. IMPORTANT: Do not spray on hot or warm surfaces. This product will affect certain plastics, rubber, various elastomers and some paints. Always test in an inconspicuous area to check product for compatibility.